Everyone always asks us the same question… where is the best place to eat at Put-in-Bay? With over 2 dozen different dining options, we decided to come up with our Top 10. What do you think?!? Mr. Ed’s is definitely the place to be for lunch, dinner or late night on the island. The happy hour prices are unbeatable – some of the best on Putinbay – as are the bands (always crowd pleasers) and the rooftop bar upstairs (the view of downtown Put in Bay is amazing). The sports bar feel of the afternoon, where you can eat wings and watch the big game on one of 15 plasma TVs, segues into an all-night indoor and outdoor party after dark. A lakefront restaurant serving some of the freshest seafood on the Ohio islands, including its world-famous Lobster Bisque – what’s not to love? The menu for this casual family dining restaurant includes choices from a seafood lover’s dream, like perch, Alaskan King Crab, and shrimp, as well as burgers, fries, and pizza. A great mix of live bands can also be found at The Boardwalk. Getting to Put-in-Bay by your own personal boat? The Boardwalk has 80 mooring buoys and a harbor taxi for diners. The Chicken Patio, located in downtown Put in Bay next to the Roundhouse, has been an island staple since 1952. It is not high class. It is not fancy dining. It is just incredibly good food! There is one thing on the menu and that’s it… the Half-Chicken Dinner. 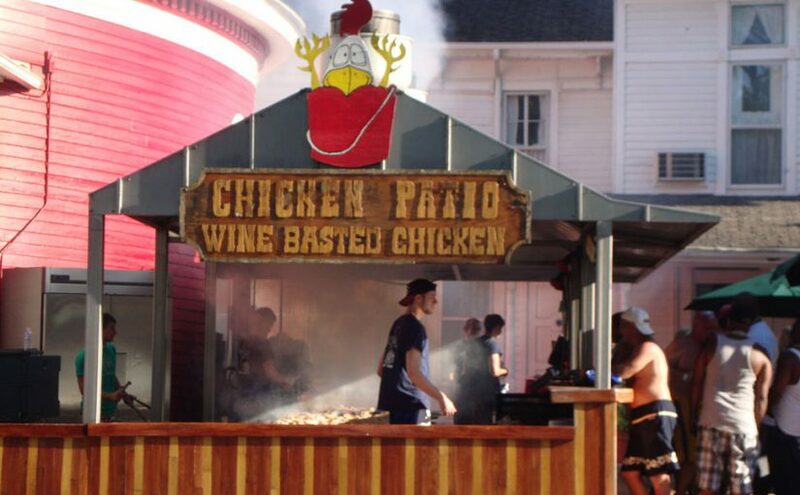 The chicken is grilled over a 21-ft. open pit and is slathered with Chicken Patio’s own famous wine-based barbeque sauce. Dinners also come with a roll, potato salad, and sweet corn on the cob. Bon appetit! Enjoy a crisp and refreshing ice cold island beer in one of Frosty’s frosted beer mugs! Combine that with a slice of pizza and a game of pool with your pals, and you’re in Put-in-Bay heaven. If you’re up before the middle of the afternoon the next day, stop by for a delicious breakfast. Press House Joe’s Bar and Restaurant? With a motto of “Beer is Food. Eat at Joe’s,” how can you go wrong? Stop by Joe’s Bar to get a personal vibe and some local color – you’ll swear you’re in old Key West. Joe’s also serves surprisingly affordable sandwiches and dogs and has a carryout beverage store onsite. Did we mention that Joe himself is a pretty cool guy with lots of good stories? We have one brewery on Put-in-Bay island, and this is it. The Brewing Co. is home to a secretly great pizza, late nights (open until 2:30 a.m. daily), live entertainment and at least three different beers brewed right here: Ole Cotton Top Irish Red, Summer Brew and Fat Man’s Friend. If you are lucky, you may visit while the Watermelon Wheat or Christmas Ale is on tap… it goes fast! Kids and adult menu offer wide variety of appetizers, pizzas, wings, sandwiches, ribs, steak, perch, South of the Border menu and Putinbay’s only Beer Cheese Soup. Dine in or takeout. Situated within the Harbor Village complex, Blu Luna has a variety of options for all tastes. Wood fired pizzas and fabulous martinis are a few examples of the great offerings this eatery offers. Enjoy views of Perry’s Monument from their outdoor patio. Stop by and check out one of Put-in-Bay’s newest offerings! This French bistro-style restaurant features indoor and outdoor seating, as well as take-out. The café serves breakfast, lunch and dinner, and kids will love the delicious variety of sweet and savory crepes while parents will love the craft beer options. Panini, soups, salads and flatbreads are few of the other menu items. The food is outstanding, the service is good, and any place that has lattes with Nutella in them is AOK in our book! Don’t miss out on this new PIB breakfast (and lunch) favorite! The name alone will get your mouth watering. The Chocolate Cafe and Chocolate Museum at Put-in-Bay has a multitude of items relating to this favorite snack of many. The gift shop has trinkets, t-shirts and unique gifts for all of your chocolate lovers. Decadent chocolate and ice cream is also available for your delight. Open for breakfast!